I'm really on a kick of using some of my sprites from AuroraWings and here's my second one in a week. This image is the Lilac Sprite. I remember the beautiful lilacs I had at my house before I moved. I spent several years tending them and training them to grow up over the railing on the second-story deck I had. Each year that they bloomed, they'd hang down over the drive which ran underneath the deck. Oh, they were so marvelous in the late spring and early summer! Their scent filled the air. I colored with ProMarkers, and cut her with a die from Spellbinders. The delicate, lacy frame is also cut with a Spellbinders die. I had that gingham paper left on my craft desk from doing another project a couple of days ago and decided to use it up instead of tossing it out. I tied a 'bowtie' bow from a bit of white lace, then "dyed" it with one of my ProMarkers. I made that the only embellishment because I really wanted the image and the frame to be the central focus on this card. In your favourite colours Connie, this is a darling card, beautiful colouring on the sprite. Love it. your card is so lovely with this precious Sprite! it makes me excited for ours to bloom, but first we need all of the snow to melt. ;) you have colored her perfectly! thank you so much for stopping by my blog and leaving such a nice comment! it made my day to 'see' you!!! Gorgeous card Connie. Your coloring on here is so pretty and I love the framework. I can just picture how pretty your flowers must have been. This is beautiful!!! 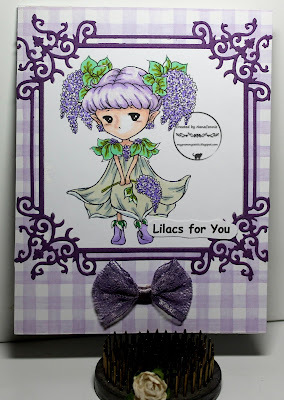 Your image is so sweet; and I love lilacs, too!! Gorgeous frame; I have the same die; thanks for the inspiration to use it. Thanks for playing with Di's Digi Designs. So precious Connie! FABULOUS coloring and design! Thanks so much for playing in our Fussy and Fancy Challenge! Please come back again soon! Gorgeous card - the image is adorable and the gingham paper and beautiful frame die look great with it. Thank you for joining in the challenge at Di's Digis. Hello… Thanks for joining our ‘Anything Goes’ challenge with your lovely card.